Camilla Casey London, UK - BOUNDLESS HIMALAYAS TREKKING & EXPEDITION (P.) LTD.
One very nervous ‘Little London lady’ leaves her sister after a three month stint in south east Asia to arrive to the warm similes + greetings of a wonderfully welcoming Min Thapa… not only that but from Day 1 all the way through my stay absolutely everything was organized for me- my stay required absolutely no need to ever open my ‘lonely planet’! The treks were perfectly chosen by Min. Certainly + by no means a ‘Walk in the park’ in fact I managed more blisters on my treks than running the ‘London Marathon’. I can safely say I will be recommending Boundless Himalayas Trekking and expedition to all; specially those wanting to ‘shift a few pounds’ in a very short period of time! My trek has given me a ‘taste’ into a hobby and interest I can say I feel an addiction zooming on for! 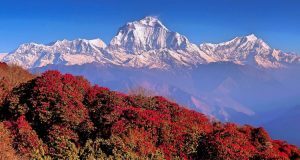 If you are looking for total harmony with nature- a challenge filled with adventure and memories of a lifetime- take up at least ONE TREK this trip ! Wishing Min and his family sincere future, success, health and beyond all happiness – what a fantastic family. P.S. I wonder which one of my lovely friends is going to be the first to read this- watch this space! Thank you for inspiring me + taking care of ME !